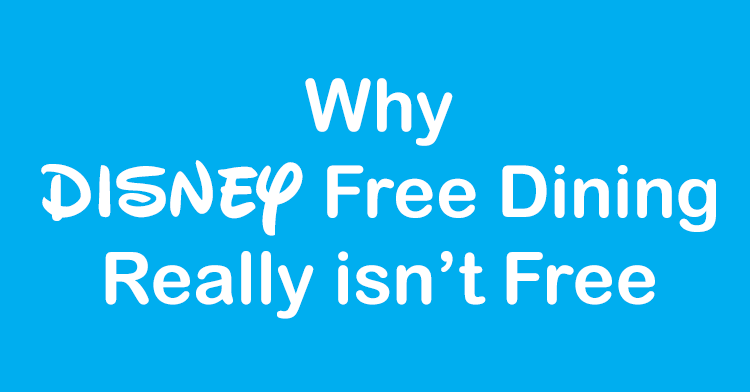 Yesterday, I wrote an article entitled Is Disney Free Dining the best Disney Discount? To save you a little time, the answer is “not always, but for most people, it is by a long shot”. To follow that up, I thought I would provide what I am expecting to see as far as the 2016 Disney Free Dining discount. Please understand: I know nothing at all about Disney’s plans, no one does other than few people inside of Disney. I do not have any source, leak or any other information, so please take my predictions as just an educated guess. This is not in any way news or information you should use to plan your vacation. Please wait until the actual discount is released before booking flights and other non-refundable portions of your Disney vacation. Do you expect to see 2016 Disney Free Dining? Yes, definitely, but for September dates only (more on that below). Please note, at some point, Disney is going to stop this madness and no longer offer Free Dining. Just try to book a restaurant right now for September, you can’t. Plus, many resort rooms are already booked up at full rate, so eventually, Disney is just going to assume they no longer need to release a discount for September since everything is booked up, and will stop. I don’t think that is this year though, maybe in 2017. The current 2016 Walt Disney World Summer discount is currently available, and will be available to book through June 10, 2016. Disney has moved away from offering Disney VISA cardholders first shot at discounts, we haven’t seen that in some time, so I do not think we will see that happen this year. I do expect Free Dining to be announced on a Monday, similar to 2015, though Monday, April 25 is too early and they will push it into the first week of May, similar to 2013 and 2014. What travel dates do you see 2016 Disney Free Dining available? This is a tough one. For 2015, Walt Disney World made very few resorts and rooms available for the dates after October 2, if you didn’t book in the first few hours on the first day, you couldn’t find a Value or Moderate resort at all. After a few days of booking, most of the Deluxe resort were gone too. Many people blasted Disney for releasing a discount but not making anything available. I don’t see Disney making this mistake again. While they may release free dining for dates after the end of September, it will probably be in a later discount once the dust settles on Fall bookings, so I don’t see them being included in the original discount. The current Summer discount runs through August 25, so I would expect to see Disney Free Dining to start on August 26, 2016. In 2015, the first block of dates ran from August 28 – Friday, October 2, 2015. Again, I see it ending on a Friday again for 2016, which would mean September 30 or October 7, 2016. October is a very busy month for Disney with the Food and Wine Festival and Mickey’s Not So Scary Halloween Party, so I don’t see Disney going into October. Historically, they have gone into October in 2014 and 2015, but only a few days. Please note, with Disney Free Dining, you qualify for Free Dining for your entire stay, up to 14 nights, as long as you check in on one of the available travel dates. So in 2015, you could check in on October 2 and stay for up to 14 nights with Free Dining for your entire stay, if you could find anything available. Do you expect to see any Disney Resort excluded from 2016 Disney Free Dining? Suites at the Walt Disney World® Resort’s Deluxe resorts, the Little Mermaid rooms at Disney’s Art of Animation Resort, Disney’s Port Orleans – French Quarter Resort, Disney’s All-Star Movies Resort, Villas at Disney’s Grand Floridian Resort & Spa, Disney’s Polynesian Villas and Bungalows, Campgrounds and 3 bedroom villas have been excluded from this offer. In addition to the regular exclusions we see all the time, All-Star Movies and French Quarter were both completely excluded, leaving just 3 moderate resorts and 3 1/2 value resorts to choose from. The French Quarter exclusion does not surprise me, as it seems to be excluded from more and more discounts. The Little Mermaid rooms at Art of Animation are excluded from EVERYTHING. The All-Star Movies exclusion however was a surprise, as we have seen it excluded from some discounts in the past, but it has been a while. Do you see any requirement changes to qualify for 2016 Disney Free Dining? Absolutely. In 2015, Walt Disney World required a minimum 3 night stay and a minimum 2 day park pass package in order to receive Free Dining. Do not be surprised if this is increased to a longer stay and longer park passes as Disney tries to reduce the number of people that qualify for free dining, or make those who want to travel during the Free Dining discount to spend more money in order to qualify. Will the 2016 Disney Free Dining discount change this year? For the last several years, guests staying at a Walt Disney World Value resort received the Disney Quick-Service discount for free, with the option to pay the difference to upgrade to one of the other Disney Dining plans. If you stayed in a Walt Disney World Moderate, Deluxe or Deluxe Villa resort, you received the Disney Dining Plan for free, again, with the option to pay the difference and upgrade to a more expensive plan. For 2016, rather than reducing the number of resorts and rooms available, Disney could change the discount so that in order to get the Disney Dining Plan included for free you have to stay at a Deluxe or Deluxe Villa resort, while Value and Moderate stays only get you the Quick-Service plan. In 2015, it was nearly impossible to find a moderate resort for our clients for most dates. For many guests, it is cheaper for them to stay at a Moderate resort and get the Disney Dining Plan for free than it is to stay at a Value Resort and upgrade to the Disney Dining Plan or at least in the ballpark, so they opt for the Moderate Resort. That, with the fact that French Quarter is excluded, put tremendous pressure on the Moderate Resorts, which sold out almost immediately for most nights. How should I prepare for 2016 Disney Free Dining? At Mouseketrips, we have always stressed booking your vacation as early as possible, there really isn’t any reason to wait. With that said, you need to remain flexible in order to take advantage of discounts. Don’t book flights or anything non-refundable until the discount is released and your reservation is set. I have had many clients assume their dates were ok for Free Dining, and miss out by one or two days, costing them thousands in lost discounts or airline change fees. Wait to do anything else until your dates are set and discount applied. At Mouseketrips, we will automatically apply any discount for you so you know you get the best rate possible. Any money you pay now is fully refundable up until 30 days before travel, and dining reservations are easy to cancel, so there really isn’t any reason to wait to see if the discount is released. If you had done that in 2015, chances are you either couldn’t find anything, you had to take your 3 or 4th choice on resort or were insanely lucky and found something. Well, there you go, complete and utter nonsense. Who knows, maybe we won’t see Disney Free Dining at all for 2016, or maybe we will see it for October – December dates again similar to 2015. I could be completely wrong, but then again, I could be completely right.